Posted on Fri, Jan 13, 2012 : 10:03 p.m.
Yep, Shawn Hunwick is feeling just fine. The Michigan hockey team’s senior goaltender made a career-high 46 saves in the Wolverines’ 4-0 win against Ohio State on Friday night at Value City Arena in Columbus, Ohio. The shutout of the No. 2-ranked Buckeyes was the third of the season for Hunwick and the eighth of his career. His last shutout, a 1-0 overtime win at Alaska on Dec. 3, started the Wolverines' current string of eight games without a loss (6-0-2). 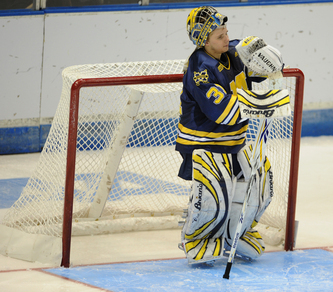 Shawn Hunwick, above, made 46 saves in Michigan's 4-0 win at Ohio State on Friday. Hunwick didn't play in last Saturday's 2-2 tie against Lake Superior State and missed practice time early this week due to an undisclosed illness. He said his Friday night didn't start out well, either. "I actually didn't have a good warm-up," Hunwick said. "I wasn't seeing the puck well at all, and they got one early off the cross bar, but once I settled in I felt comfortable and in control." Playing in front of 9,828 mostly Buckeyes fans, Hunwick was tested heavily early by CCHA-leading Ohio State (14-5-3, 10-4-3-1) but turned away 19 first period shots as the No. 15 Wolverines (13-8-4, 7-6-4-1) took a 2-0 lead. "I think with experience you learn to play better in front of big crowds," Hunwick said. "Playing in big games at the Frozen Four last season really prepared me well for hostile environments." Junior defenseman Lee Moffie opened the scoring at the 10:23 mark of the first period when a rebound off an Alex Guptill shot bounced back to the circle, where he was waiting alone for a slapshot. Moffie also had the second assist on an A.J. Treais goal that put the Wolverines up 2-0 in the final minutes of the first period. The game remained 2-0 through the second period and for most of the third until Luke Glendening and Guptill scored 17 seconds apart in the final minutes. Ohio State pulled goaltender Cal Heeter (29 saves) before the Glendening goal, which came at the 18:43 mark. The Buckeyes opted to keep the extra skater on the ice down 3-0 and Guptill promptly answered with another empty-net goal, his team-leading 11th goal of the season. "We had to keep forcing things forward after not scoring in the first period. It's inevitable that you're going to try and go with some different looks after having so many scoring opportunities," Ohio State coach Mark Osiecki said. "We had some good looks but we just couldn't get any to go in." Hunwick deflected some of the credit for the shutout to his defenders. "If you look at Ohio State, they like to get the pucks on the net and after we got the lead I think they were shooting from a little bit further out than they would have liked," he said. "Our team was doing a tremendous job of keeping it to the outside and limiting extra chances." Moffie said it was a two-way street. "We're trying to keep shots to the outside and when they do get good opportunities we're getting a stick on the puck and blocking shots," he said. "When we do make a mistake and there's a guy loose, Shawn's going to make up for it." Michigan failed to score on five power-play chances but successfully killed off all four of the Buckeyes' man-advantage opportunities. Michigan coach Red Berenson was glad to see Moffie get into the mix offensively. "I think it's important that the offense isn't always coming from the forwards and if our defensemen are getting their shots through, or jumping up, and Lee's very opportunistic," Berenson said. "He sensed that loose puck, maybe a rebound, and those are timely goals for us. Usually when your defense is scoring, you're having a good game." With the win, Michigan avenges a pair of losses to the Buckeyes at Yost Ice Arena in mid-November. It was Ohio State’s first sweep in Ann Arbor since the 1986 season. Ohio State’s 19 shots in the first period were the second-most in a single period by a Michigan opponent this season. Michigan State had 20 shots in the second period on Dec. 10. Hunwick stopped all 20 in a 3-3 tie. The loss continues a recent slump for Ohio State, which maintained its No. 2 ranking despite a pair of ties last weekend at Bowling Green, the last-place team in the CCHA. "We got a lot of shots on goal tonight and we did some things better than last weekend, but I do not think there is such a thing as a moral victory," said Ohio State senior defenseman Sean Duddy. "We are going through a funk, but the team's morale is not down." Michigan and Ohio State now take their weekend series oudoors. The teams will play at the Frozen Diamond Faceoff at Progressive Field in Cleveland on Sunday. Faceoff is set for 5:05 p.m. Sat, Jan 14, 2012 : 4:17 p.m.
Nice! Sounds like a great win! Can't wait to see if I can find an online stream of today's game. Go Blue! Sun, Jan 15, 2012 : 3:06 a.m. Sat, Jan 14, 2012 : 4:43 p.m.
No game today. Outdoors in Cleveland tomorrow at 5;05pm. Sat, Jan 14, 2012 : 3:31 p.m.
are we seeing the awakening of a sleeping giant in Michigan hockey? Let's Go Blue!! Sat, Jan 14, 2012 : 3:22 p.m. Sat, Jan 14, 2012 : 1:56 p.m.